This is the third blog post on day-of FastPass+ availability. The first blog post was in 2014, and the second in 2015. In the three-plus years since FastPass+ was introduced at Walt Disney World, we have been tracking the availability of FastPass+ reservations. The last major change in the FastPass+ process is the that you can reserve additional FastPass+ reservations through Disney’s MyDisneyExperiance app. This is a significant improvement over having to stand in line at in-park kiosks. This also means that additional FastPass+ reservations are being grabbed up by more guests. For FastPass+ overview, tips, and advice go to https://touringplans.com/walt-disney-world/fastpass. 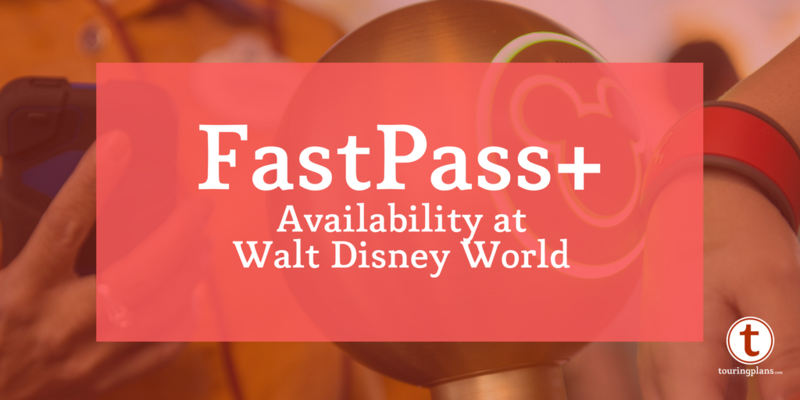 By using the FastPass+ system, we and others have observed that reservation slots can come and go quickly. The tables below show the average time when availability runs out. 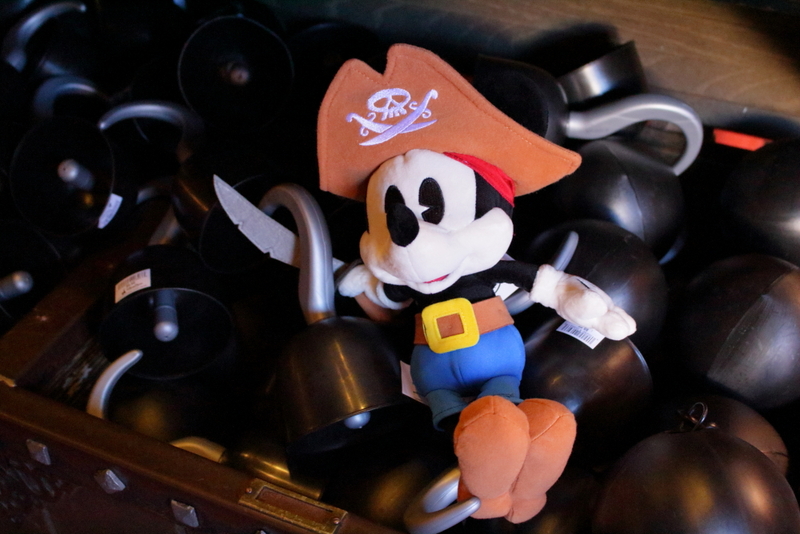 It is possible that a FastPass+ reservation may pop up, but it is unlikely. The gray cells show the number of days in advance that FastPass+ reservations sell out. A reasonable assumption would be that as crowds increase, the time when FastPass+ reservations run out would decrease. This holds up for the headliner attractions, but not so much for the lower tiered attractions. For the lower tiered attractions, the FastPass+ depletion time is more a function of when the park closes than the crowd level. The data also support the theory that Disney holds back some FastPass+ reservations for day-of guests: even if you see no availability in advance, you may find that availability once you’re in the park. Just like dining reservations, a FastPass+ reservation may be available but it may not be a desirable time. A 1 am Dumbo FastPass+ reservation is not going to be very useful if your family is sleeping. The earlier you make a reservation the more options will be available. A handful of attractions has little to no same day availability. The good news is that almost all attractions have some availability a few days before your visit. Frozen Ever After and Seven Dwarfs Mine Train are the only attractions that sell out very early. It can be very difficult to get FastPass+ reservations for these two attractions 30-days prior to your visit. Pandora opens May 27, 2017, and there will be two new attractions. They will have FastPass+ queues. 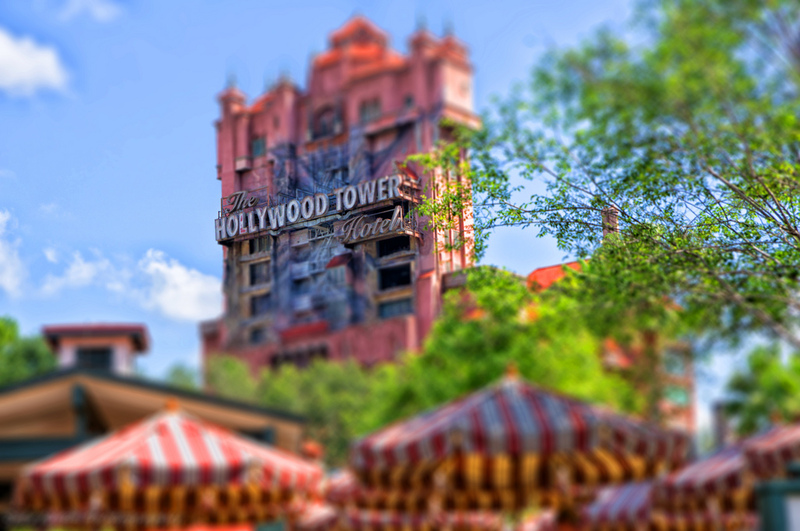 Guests can only choose one of the two attractions to make an advance FastPass+ reservation. 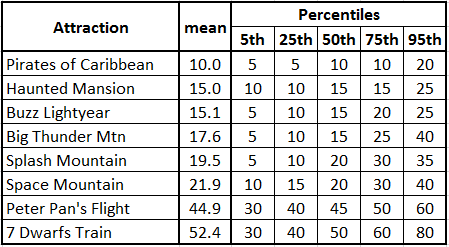 The initial data is showing that Avatar Flight of Passage is selling out before Na’vi River Journey. The attractions are not selling out as fast as Frozen Ever After or Seven Dwarfs Mine Train. If you can make FastPass+ reservations 30 to 60-days prior to your visit you should be able to get a Pandora attraction FastPass+ reservation. Daisy’s Best Week Ever November 3, 2016: Everything But Animal Kingdom! While I’ve loved using FastPass+ for certain attractions, there are pre-shows that I would have hated to miss (Peter Pan’s Darling’s House, Expedition Everest’s Yeti Museum, etc.). What would I be missing in the Pandora attractions if I used a FastPass for either one and would it be worth the shorter wait? I’m sure the Pandora attractions will have highly themed queues. “Is it worth missing?” all depends on the value of your time. Peter Pan’s queue is great but I will not wait 45 minutes to ride the attraction. With the right strategy, you don’t have to miss anything. Grab a Fastpass for later in the day, but make those attractions your first priority in the morning. That will allow you to experience the full queue with little wait, then skip the queue for one of the rides later in the day. From what I’ve seen, it seems like River Journey should have higher capacity and faster loading than Flight of Passage, so I’d say FoP should be the Fastpass priority for most people. So what I’d do is get a Fastpass for Flight of Passage for 60-90 minutes after park open. At rope drop, make a beeline for Pandora, ride Flight of Passage first, then River Journey. By the time you’re done with both, FP should be ready for FoP again, and if it’s not, just spend some time taking in the ambiance until it is, or even ride River Journey again if there’s little wait. Then go enjoy the rest of Animal Kingdom until the evening when Pandora will really come alive. The other two Fastpasses I’d get in the morning would be for Kilimanjaro Safari and Expedition Everest (as long as that ride hasn’t yet gone down for refurb, as is rumored). If Everest is down, I might FP a show. Same day FP for Dinosaur usually isn’t tough to get. Sounds like a good plan. Thanks. Steve: Can you explain how 7DMT runs out at 60 days on a Crowd Level 1? I was wondering about this too. The short park hours would be part of it but the big jump from CL2 to CL1 suggests to me that they allocate way fewer FP+ slots on the least busy days. Just saw Banjoman’s comment, and that’s certainly a plausible scenario as well. I’d forgotten that FP allocation could vary, and that information isn’t available. Possibly sampling error at play here. There are very few Crowd Level 1 days any more, and it might be tough to get data. That said, if I had to guess, I’d say that DVC members tend to go during low crowd times, and they’ll be more savvy about how to use the system. Since the 60 day booking times are actually 60+length of stay, those folks will have an advantage a bit further out than some guests might. That’s all speculation on my part, though. It looks like the chart may be showing in reverse? Maybe the scale should go from 10 -> 1? @Brad- I double-checked the data, and the median run out is 60 days. The data I used for the analysis only includes 2016 and 2017. There were only 16 days with observed crowd level 1 for the Magic Kingdom. The other days had FP+ running out 60-days in advance. Were most/all of those “other days” party nights, with 7 pm closes? All except one of the “other days” were part nights. True. Days where the crowd level is 1 there are still queues with waits. A touringplan will help guests to avoid the longest wait times. 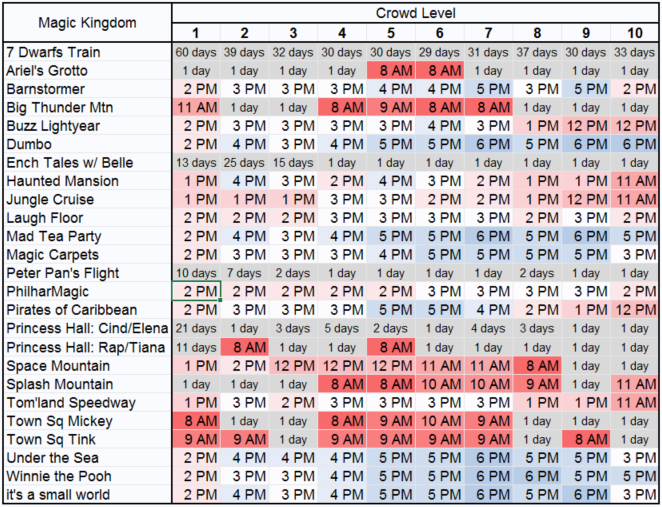 Below is a table showing the distribution of Magic Kingdom posted wait times on crowd level 1 days. It’s obvious the crowd index is inverted. Otherwise you are saying that in EVERY SINGLE CASE that low crowd days sell out sooner than high crowd days. No, it’s correct. As mentioned above, there are factors including park hours and FP+ allotment that can cause the lower-crowd days to go earlier. But in any case, there are plenty of examples in the charts above where an attraction’s FP+ is running out earlier on a 10 day than on a 1 day, so that “every single case” thing you’re saying doesn’t make sense. Looks like those of us who are staying off site on their next planned trip are hosed at getting FPs for 7DMT and Frozen Ever After as we have only a 30 day advance window. Thanks so much for updating this! It’s very useful and I recommend it in Chat all the time. it’s great to have the latest data. Touring Plans has been a great asset on our visits to Disney World and Land! Regarding Fast Passes, I still think Disney made a huge mistake adding them to continuous moving lines like Peter Pan. It has always been a busy ride, but in the days before FP’s you didn’t mind the line because you were always moving and you got to see the added features throughout the queue area. Fast Passes can be great for the other type of rides, but the continuous moving ones I think it makes the lines worse. I wish you would have used the terminology “run out” or “running out” in the article instead of “selling out” or “sold out”. Theoretically, anyway, fast passes aren’t for “sale”. I don’t think FPs that were gone then becoming available day-of necesarily means Disney is holding back FP for same day guests. I think the majority are because someone holding those FP changes their plans and cancels or modifies the FP. There are a lot of cancellation FPs popping up throughout the day. I didn’t have to look very long before finding at 8 pm frozen FP at Epcot at 7 pm.